A suburban development outside Beijing, “Orange County” is just one of many gated communities springing up on the edges of cities worldwide. Photo by Andrew Stokols. Red tile roofs, a backyard barbecue, a clubhouse in the style of a French chateau. Welcome to Orange County. No, not Orange County, California, the famed suburban region known for its beaches and McMansions. This is Orange County, Beijing. The resemblance to an American suburb is uncanny. Of course, the water peddler pulling a tricycle down the street and the pollution is a reminder that alas, you are still in Beijing. 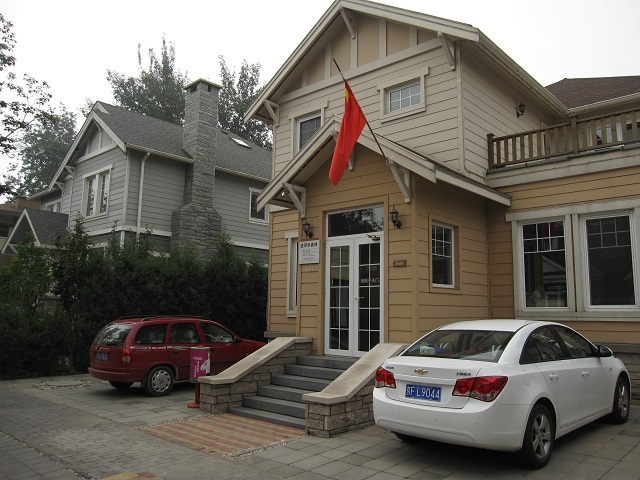 But for middle class and wealthy Chinese residents, this is the closest thing to buying a house in the United States: a slice of American suburbia on the edge of Beijing. The phenomenon of ersatz American suburbs is not limited to China alone. The outskirts of Bangalore, Chennai, and Hyderabad, southern India’s IT hubs, are sprinkled with American-style homes and gated communities. However, this type of single-family development is a major contributor to urban sprawl. Housing like this fosters dependence on the automobile, class divisions and inequality. Curtailing this kind of sprawl with smart planning and urban design strategies will be crucial to reducing cities’ carbon footprints, and creating more equitable patterns of urbanization. Gated communities: A utopia or dystopia? Developments like Orange County, Beijing may seem amusing to Westerners, but they are increasingly popular in rapidly developing countries around the world. Beijing’s northern periphery is sprinkled with suburban developments bearing names of exotic Western locales: “Napa Valley, Yosemite, Vancouver Forest, Riviera. On the edge of Shanghai, a series of themed European towns have popped up, each in the style of a different European nation. 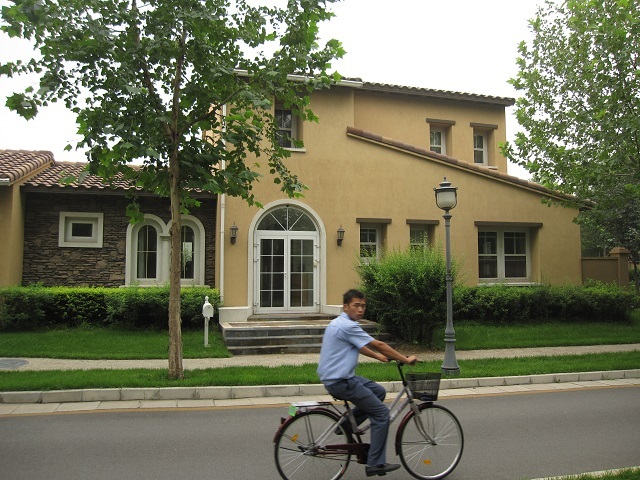 In the early 1990s, these houses were mostly occupied by diplomats or expats, Today, gated upscale communities of single-family homes are often the sought-after choice of residence for rising middle classes in China, India, Brazil, and beyond, for wealthy, upwardly mobile consumers who want to enjoy the same comforts of suburban living that the West has long taken for granted. “Vancouver Forest” is a suburban development outside Beijing. Photo by Andrew Stokols. There are indeed many reasons why those who can afford it are choosing to wall themselves off in exclusive suburbs. In cities with high poverty and crime rates, the allure of private security, privatized city services, and functioning utilities is hard to resist. The desire for the lifestyle symbolized by single-family homes is not something that can be easily dismissed as unimportant. Recognizing the potentially destabilizing effect of luxury lifestyles amidst persistent poverty, some city officials have taken measures to curtail the proliferation of elite lifestyles. City officials in Beijing and Chongqing have attempted to ban the use of words connoting luxury in advertisements, including those of luxury housing developments. But such superficial measures, of course, fail to shift either consumer desires or urban planning policies. Instead, city leaders should focus on tangible solutions that curtail sprawl and foster compact cities. Urban Growth Restrictions: Cities in the United States have tried to curtail urban sprawl with a variety of policies–some, like Portland’s well-known urban growth boundary, more restrictive than others. But the rapid urbanization, or rather suburbanization, occurring in developing countries today is poised to far outdo America’s sprawl. Denser Layout of Single-Family Homes: Planning for a denser arrangement of homes is one way to accommodate single-family houses in a more compact urban form. The townhouse, a common residential form in many American cities, is one way of doing this. Today, turn-of-the-century townhouses in Washington DC or Brooklyn, NY can fetch millions. Yet, these neighborhoods are able to achieve density, walkability, and real-estate desirability without fencing themselves off completely from the rest of the city. Changing Attitudes: It’s easy for those in developed countries to look down on such communities as tacky replicas of American suburbia, having taken this kind of lifestyle for granted. But for cities in which the vast majority of residents live in apartments, the chance to own one’s freestanding home is a symbol of a better life. Transforming the ideal conception of home from suburban McMansion to a more compact, sustainable lifestyle requires large cultural shifts as well. And not just in the developing world: the same subdivisions are still being built in the U.S. because developers think that is what consumers desire. In addition to worsening inequality, there is an even more direct economic rationale for curtailing sprawl: a recent report from the New Climate Economy estimated that sprawl costs the United States up to $1 trillion per year, much of it in increased infrastructure costs that low-density communities require. For developing countries intent on maximizing economic growth, this should be as strong a reason as any to change course.